Dutch international striker Dirk Kuyt became Rafael Benitez his sixth summer signing of 2006, when he arrived from Feyenoord in August. He was Liverpool record signing when arriving for £9.5million to sign a contract until 2010. He extended his contract with another two years until 2012 in April 2009. Two years later, Kuyt extended for another season until June 2013. He was one of the key players of the team and made a reputation for scoring big goals in big games for Liverpool. Notable strikes include one in the Champions League final against AC Milan, a magnificent hat-trick against Manchester United at Anfield and a strike during the Carling Cup triumph over Cardiff City at Wembley in February 2012. In June 2012 he annouced a move to Turkey. 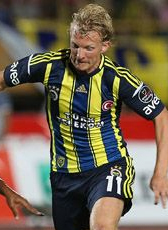 Kuyt signed a 3-year contract at Turkish giants Fenerbahce SK until June 2015. In April 2015 he announced his return to the Netherlands in the summer when his contract expire. He joined his former club Feyenoord for the 2015-16 season and extended to 2017 after making big impact on the team. In June 2017 his contract expired at Feyenoord and he has won the Championship with Feyenoord. Kuijt hang up his boots after helping his club to win the league title. He has played his final international match in 2014 against Italy (as captain) and was capped 104 times for the Netherlands.